The Four Tops came from Detroit and started as a high school band called The Four Aims (1954). 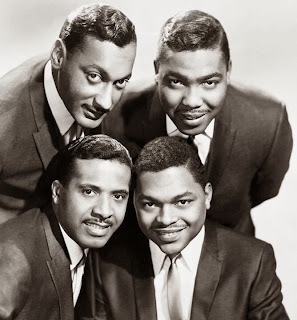 The lineup was lead singer and Jackie Wilson‘s cousin, Levi Stubbs (1936 -2008) , Abdul "Duke" Fakir, Renaldo "Obie" Benson (1936 – 2005), and Lawrence Payton (1938 – 1997) and signed to Chess Records in 1956. To avoid confusion with The Ames Brothers, the group changed their name to Four Tops. Lead singer Levi Stubbs was a baritone whilst most other groups were fronted by a tenor and this gave them an instantly recognisable sound but recording success eluded them, and despite several record company changes, nothing came. Meantime the group toured frequently and built up a polished stage presence and proved very popular on the supper club circuit. Berry Gordy Jr., encouraged the Four Tops to sign for Motown Records in 1963. At first they recorded jazz standards for the Workshop Label (subsidiary of Motown Records) and provided backup vocals for other artists. When song writers Holland-Dozier-Holland came up with an instrumental track they decided for fun to craft a pop song for the Four Tops. The end result was "Baby I Need Your Loving" which was released in 1964 and reached #11 in the US. The next two singles were less successful for the group but when they released their version of "I Can't Help Myself (Sugar Pie, Honey Bunch)", in 1965, it went to number 1. More hits were to follow including, "It's the Same Old Song", "Something About You", "Shake Me, Wake Me (When It's Over)", and "Loving You is Sweeter Than Ever". Holland-Dozier-Holland wrote most of Levi Stubbs' vocals in the tenor range and near the top of the range, to get a sense of urgency in his gospel preacher-inspired leads. The Andantes (female backup singers) featured on many of their songs to add a high end to counterbalance the low-voiced harmony of The Four Tops. The Funk Brothers were in support and together their works represented the epitome of the Motown Sound. The group had their biggest success in 1966 with "Reach Out I'll Be There,” followed by "Standing in the Shadows of Love, “ and "Bernadette.” By 1967, The Four Tops were the most successful male Motown act in the United Kingdom. In the United States, they were second only to The Temptations. Changes in popular music tastes found the group experiment and more hits followed with their version of Tim Hardin's "If I Were A Carpenter" and Left Banke's "Walk Away Renée.” These were the last hits produced by Holland-Dozier-Holland, who left Motown in 1967. In 1972, when Motown moved to Los Angeles the Four Tops decided to stay in Detroit and signed for ABC-Dunhill. "Keeper of the Castle,” "Ain't No Woman (Like the One I've Got)", "Sweet Understanding Love", "Midnight Flower", and "One Chain Don't Make No Prison" were all R&B Top Ten hits. By 1976, the hits had dried up and the Four Tops were without a record contract. They signed with Casablanca Records and "When She Was My Girl," was a #1 R&B hit in 1981. The Four Tops returned to Motown Records briefly in the mid 80s and worked in the fields of television and motion pictures. They continued to enjoy live performances until Laurence Payton died in 1997 and Levi Stubbs, Obie Benson, and Duke Fakir toured as a trio called The Tops, in 1998 they recruited former Temptation, Theo Peoples to join the act to restore the group to a quartet. By the turn of the century, Stubbs was becoming ill from cancer (died 2008), and Ronnie McNair was recruited to fill in the Laurence Payton position, with Peoples stepping into Stubbs' shoes as the lead singer of the Four Tops while Payton's son Roquel replaced an ill Obie Benson, who later died in 2005.